A classic never goes out of style” rings true with this sophisticated and timeless design featured in a brilliant rose gold. 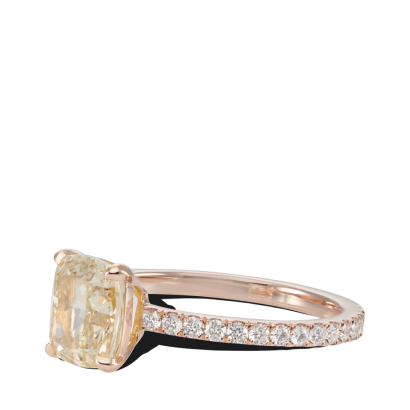 A Fancy Yellow Cushion cut diamond sits in this four prong solitaire. Smooth mushroom cut pave glitter and adorn the shank. A ring that truly promises an everlasting shine. Designed for a 1.5ct cushion stone. Can be made for any size center stone. *Price is for the metal, labor and melee. 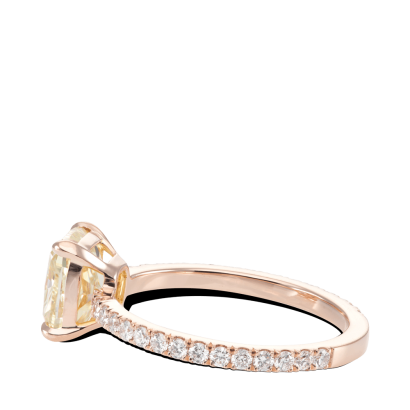 Price subject to ring size and carat weight. Center stone is sold separate.